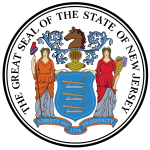 The New Jersey Department of Environmental Protection (NJDEP) is a government agency in the U.S. state of New Jersey that is responsible for managing the state's natural resources and addressing issues related to pollution. NJDEP now has a staff of approximately 2,850. The department was created on April 22, 1970, America's first official Earth Day, making it the third state in the country to combine its environmental activities into a single, unified agency, with about 1,400 employees in five divisions, charged with responsibility for environmental protection and conservation efforts. Governor William T. Cahill appointed Richard J. Sullivan as the first commissioner. In December 2017, Catherine McCabe was nominated by New Jersey governor-elect Phil Murphy to serve as Commissioner of the New Jersey Department of Environmental Protection. The major goal of the air quality division is to ensure the cleanliness of the air quality by enforcing air-pollutant standards imposed by the federal Environmental Protection Agency. Water monitoring and standards has the primary responsibilities of closely monitoring the state's fresh, marine, and ground waters, developing surface and ground water quality standards, and characterizing and assessing water quality. The gathered information, data, reports and analysis are used to inform organizations and the public to make better decisions on behalf of water usage. The land and open space division provides rules and includes information concerning wetlands, coastal, and stream/floodplain encroachment programs. The site remediation program requires all remediations in the state to proceed under the supervision of a licensed site remediation professional that they may follow the nine requirements set forth at N.J.S.A. 58:10B-1.3b. The goal of this program is to speed up and increase the pace of remediation, thus helping to decrease the threat of future contamination. A solid and hazardous waste management program is responsible for conducting educational and public relations campaigns on behalf of recycling, although its activities have been reduced since funding cuts in the mid-1990s. The Division of Parks and Forestry protects state and private lands from wildfire, manages the forests, educates the public, grows trees to maintain and restore forests in rural and urban areas, and preserves the diversity of the trees within the forests. The Division of Fish and Wildlife works towards protecting and managing the state's fish and wildlife resources. ^ "Murphy nominates ex-acting EPA chief as state DEP commissioner". nj.com. Retrieved 30 April 2018. ^ "NJDEP Division of Air Quality". State of New Jersey. Retrieved 26 June 2012. ^ "NJDEP Water Monitoring & Standards". New Jersey Department of Environmental Protection. Retrieved 26 June 2012. ^ "NJDEP Land & Open Space". New Jersey Department of Environmental Protection. Archived from the original on 2 July 2012. Retrieved 26 June 2012. ^ "NJDEP Site Remediation Program". New Jersey Department of Environmental Protection. Retrieved 26 June 2012. ^ "Solid & Hazardous Waste Management Program". New Jersey Department of Environmental Protection. Retrieved June 27, 2012. ^ "Division of Parks & Forestry". New Jersey Department of Environmental Protection. Archived from the original on 27 June 2012. Retrieved 27 June 2012. ^ "Division of Fish & WIldlife". New Jersey Department of Environmental Protection. Archived from the original on 4 July 2012. Retrieved 27 June 2012. This page was last edited on 13 April 2019, at 12:34 (UTC).